The cooperation with the EU is an investment that is made in the education sector, which is very useful for the future, head of the EU delegation in Azerbaijan Kestutis Jankauskas said. 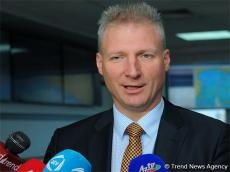 Jankauskas made the remarks in Baku at the event entitled "Strengthening Research, Development and Innovation in Azerbaijan’s Higher Education", Trend reports on March 1. The EU has been working in all spheres of the education sector for many years, he added. Jankauskas stressed that the Azerbaijani universities must improve the training of local staff. He said that local universities must train qualified personnel. What should be done for the Azerbaijani universities to be among the best universities? The good, tested experience of European countries may be used, Jankauskas added.